1 of 2 Bring a large pot of salted water to a boil. Cook linguine according to package directions, about 10 minutes. Drain and rinse under cold water until cool. 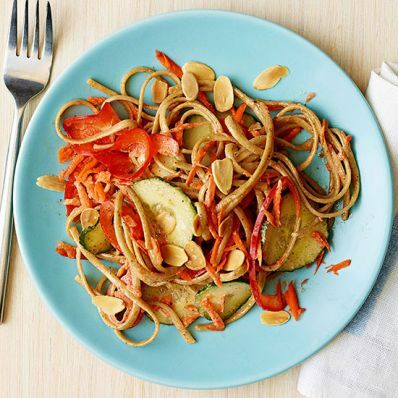 Toss with sweet red pepper, carrots and cucumber. 2 of 2 In a separate bowl, whisk together almond butter and canola oil until smooth. Whisk in vinegar, honey, salt, sesame oil and pepper. Pour over linguine and mix well. Serve at room temperature or chilled. Garnish with sliced almonds, if desired. Per Serving: 8 g pro., 275 mg sodium, 6 g fiber, 7 g Fat, total, 0 mg chol., 1 g sat. fat, 37 g carb., 223 kcal cal.